It was a herd of feral horses on the windswept Namib Desert that convinced Calgary painter Jennifer Mack to become a full-time equine artist. Training at the Alberta College of Art and the Duncan of Jordanstone College of Art in Dundee, Scotland, allowed Mack to explore colour and texture through ceramics, textiles and mixed media as she was strongly discouraged from painting horses by her professors. 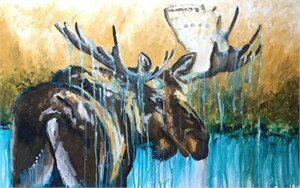 Mack’s canvases depict the untamed, unmatched spirit of the horse in rich, undiluted colours or high-contrast monochromes. Acrylics used with bold intensity and high-quality India inks give the compositions movement, emotion and impact, generating within the viewer, a palpable physical and emotional intimacy with each of her paintings. The canvases are then varnished with high-quality MLS varnishes that include UV sun protection solutions for maximum longevity. It was a herd of feral horses on the windswept Namib Desert that convinced Calgary painter Jennifer Mack to become a full-time equine artist. Training at the Alberta College of Art and the Duncan of Jordanstone College of Art in Dundee, Scotland, allowed Mack to explore colour and texture through ceramics, textiles and mixed media as she was strongly discouraged from painting horses by her professors. Her deep love of these animals, which was fostered as a child growing up on a large, Alberta farm, however, was never fully bridled. Those Namib horses captivated Mack as she observed them and sketched them for weeks, from a promontory above their watering hole, recognizing in the process the irreversible return to her first love, freedom, the horse. 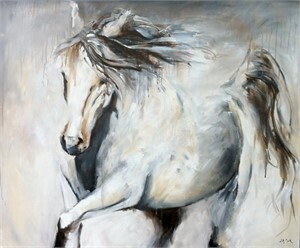 Mack’s canvases depict the untamed, unmatched spirit of the horse in rich, undiluted colours or high-contrast monochromes. Acrylics used with bold intensity and high-quality India inks give the compositions movement, emotion and impact, generating within the viewer, a palpable physical and emotional intimacy with each of her paintings. The canvases are then varnished with high-quality MLS varnishes that include UV sun protection solutions for maximum longevity. 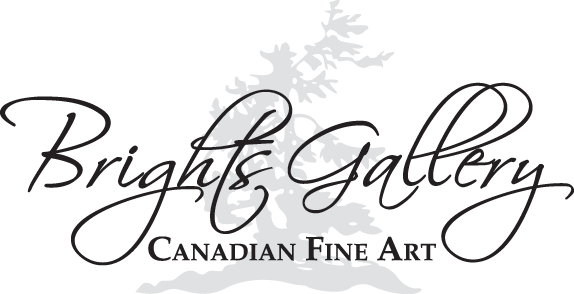 Mack exhibits annually at the Spruce Meadows Masters tournament in Calgary and is represented by galleries across Canada, and is collected internationally by corporations, private collectors, and horse lovers. She does accept private commissions.